A pregnant mom willingly goes through many phases and hardships in those 9 months of struggle just to keep her baby healthy. But one cannot forgo the chances of complications during pregnancy owing to various biological, physical and mental factors. One such case is kidney infection while pregnant, also known aspyelonephritis, which is potentially dangerous for would-be mothers. In some recent studies, it has been found out that untreated pyelonephritis can lead to renal failure. 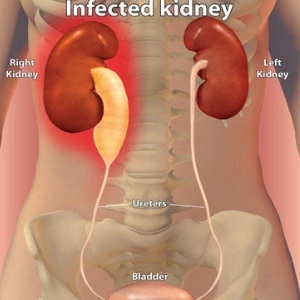 In addition, those suffering from kidney infection have a high risk of delivering preterm, leading to serious complications and even death of the mother and child. What Causes a Kidney Infection During Pregnancy? Pregnancy is one of the most sensitive phases for a woman, leaving her exposed to many psychological and health troubles. Also, it is noticed that during pregnancy, these changes can even interfere with the normal flow of urine, making a pregnant woman more easily to catch kidney infections when compared to other women. The bacterial infection first originates in the lower urinary tract, rides up to the urethra and genital area, and eventually to the bladder and one or both kidneys. As concluded by researchers, kidney infection while pregnant has a probability of 1-2%. In a normal body, the urethra and the ureters work simultaneously, with the former draining urine from the kidney into the bladder and the latter throwing it out of the body. During pregnancy, with hormones overpowering the functioning of various organs, the high concentration of the hormone progesterone paves a way to eventual contraction of the ureters. Another trouble occurs with enlargement of the uterus that further compresses the ureters, leading to stagnant urine deposition in the kidneys. Thus, the growing bacteria such as E.coli, Klebsiella pneumoniae, or Staphylococcus can make their way to the kidneys and cause infections. What Are the Symptoms of a Kidney Infection During Pregnancy? As we have learnt in the previous section, the risks are high of getting kidney infection while pregnant, so we need to know the signs and symptoms of pyelonephritis. This condition is classified into 2 types: acute and subacute, and the symptoms vary in both the cases. How Is Kidney Infection During Pregnancy Diagnosed? In addition to basing the diagnosis on signs and symptoms of kidney infection during pregnancy, you may also be asked to take up a urine test to examine whether there are bacteria, presence of blood or pus in the urine. Blood sample could be taken to conduct a blood culture. Other diagnosis methods include ultrasound, tomography scan, x-ray that can very well show any abnormalities in your bladder and ureters. As there are risks to the fetus and the mother once she is diagnosed with a kidney infection, doctors generally recommend hospitalisation for the patient. It is better to remain under observant eyes in such cases. Complete bed rest is provided to the patient with some pain relief. Patients are often asked to keep their knees flexed for proper relaxation of abdominal muscles. Medication starts with the necessary antibiotics like cefazolin or ceftriaxone and additional dosage is provided depending on the severity. Once discharged, you may be asked to take oral antibiotics for 7-10 days. To reduce the volume of urine and increase fluidity, you will be advised to drink more fluid which canhelp withthe removal of bacteria from your body. Additionally, caffeine and alcohol are to be avoided during the course of infection, as they could make you urinate more frequently. Clear Watery Vaginal Discharge: Is It Normal? When to Worry?